I’m trying this new diet where I eat one serving of quinoa everyday at anytime of the day either breakfast, snack, lunch, or dinner. Today, I made a quinoa salad, but mixed up the ingredients a little bit, and I have to say that this is now another one of my favorite dishes. It has a nice blend of vegetables, whole grains, MUFAs, and fruits, which made it sweet and tangy but not over-the-top. I think it’s a perfect salad for lunch or even to share as a side dish with someone else. And it’s easy to make and even full of antioxidants! 1. Wash all the vegetables carefully. On the side, cook the quinoa with the seaweed inside just as you cook rice. 2. Place the spinach and the asparagus in a saucepan and cook. I steamed them with water since I wanted to add olive tapenade to my salad, but you can sauté them if you wish with some olive oil or sesame oil. Add the ginger root/powder to the saucepan. You can add a little salt if your tastebuds need it. 3. Set aside your avocado, strawberries, blueberries, and cherry or grape tomatoes. Take out your olive tapenade or the dressing of your choice – I used Trader Joe’s Olive Tapenade Spread which I love because it’s natural and not too oily, but gives a perfect, simple salad dressing! Feel free to use a vinaigrette or a simple oil dressing depending on your taste! 4. Once all the vegetables have been cooked, place the quinoa and seaweed first as the bed of your salad. Then layer with your vegetables, then the diced avocado, followed by the tomatoes, and finally topped with the fruit. Using a tablespoon, spread the olive tapenade over the salad. I used a plastic container to pack this lunch salad so I simply covered the container and shook the salad around to mix the ingredients together. If you are serving in a bowl, use utensils to spread the olive spread evenly over your salad! Being vegetarian/vegan, how much protein can we possibly eat? We’re known more for eating whole grains and my personal favorite is oats. 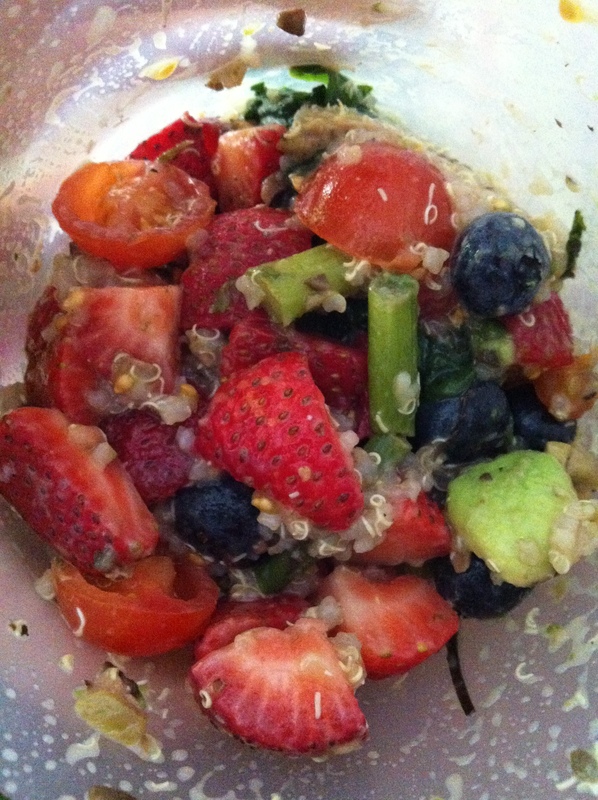 Every morning, I make a new type of oatmeal, playing around with what I add into it to make it taste delicious. This morning, I made a blueberry almond oatmeal for breakfast that was both filling and delicious with added flaxseed, making it rich in omega-3 acids. 1. Place the rolled oats into a bowl and pour in the liquid of your choice (milk or water). 2. 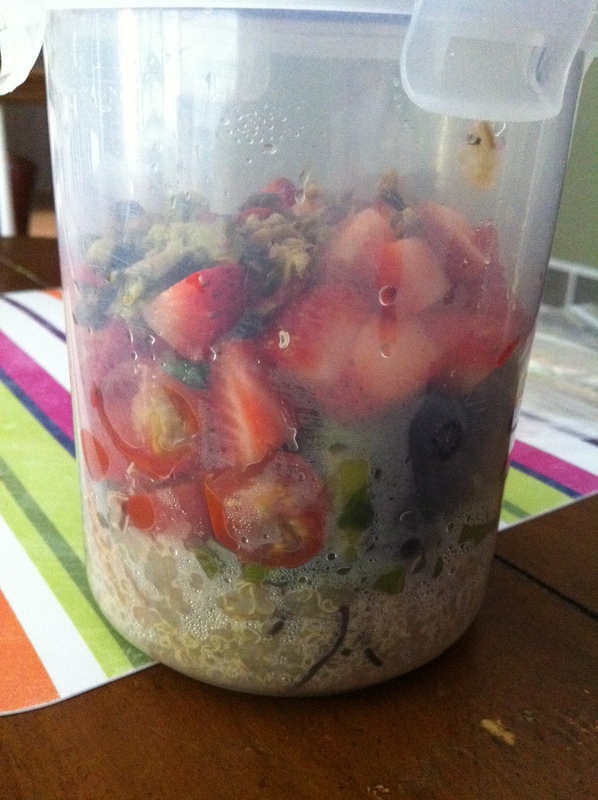 Spoon in your tbsp of flaxseed and microwave the oats for 1-2 minutes until they are completely cooked. 3. The bowl will be hot so be careful when you take it out of the microwave. 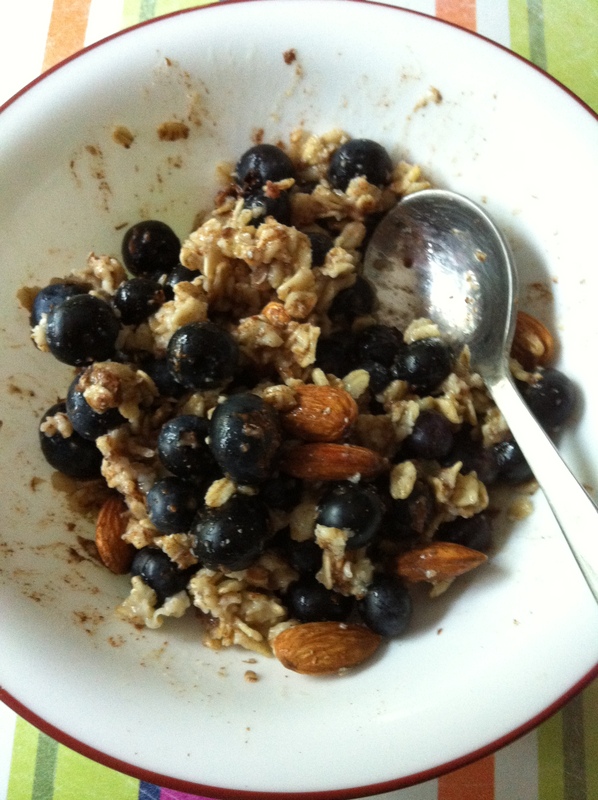 Sprinkle the oatmeal with your blueberries and almonds, and top everything off with cinnamon powder.